The original all-American room broom — the Ingram MAC-10 — was a child of the 1960s but will likely remain iconic for generations. Springing from the mind of California-born Gordon B. Ingram, the MAC-10 was the end result of nearly two decades of the inventor’s obsession with interesting submachine gun designs. 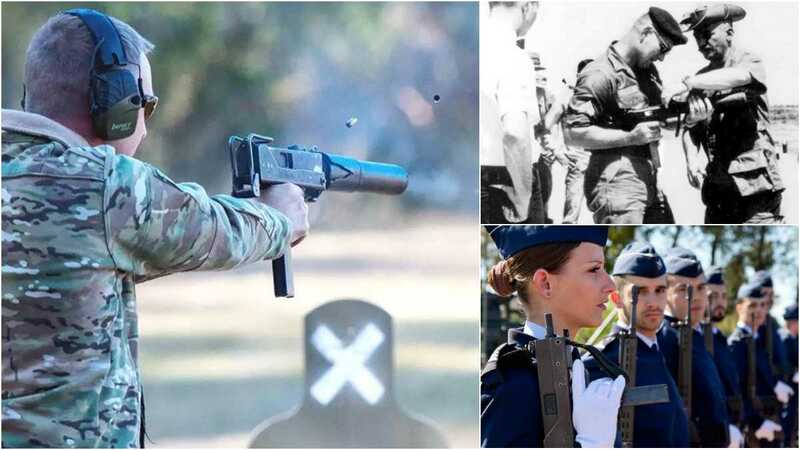 A WWII infantry vet who saw service in Europe, Ingram had a first-hand working knowledge of 1st and 2nd generation SMGs like the Thompson and M3 Grease Gun and, by 1946, had crafted his own, albeit unsuccessful, burp gun design. Eventually, he continued down the path until the Ingram Model 6 was put into low-rate production and, pitched to military and police users, was adopted by a few prisons and the Peruvian military. Then came his Models 7, 8 and 9 (see where we are going with this?) through the 1950s, until he finally hit the relative small gun big leagues with his 1964-designed Model 10. Manufactured at first by the Military Armament Corporation in Georgia, which was basically just Ingram and early suppressor magician Mitchell WerBell along with a few investors, the M10 was simple and cheap. Made from sheet metal stampings and originally just full-auto-only, the compact open-bolt machine pistol was less than 11-inches long overall with its wire stock compacted and could tickle off at about 700 rounds-per-minute. Although the straight-blowback design was at first prototyped as being chambered in 9mm Para, production soon switched to .45ACP while a smaller .380ACP variant was labeled the MAC M11. The gun was built by MAC and its successors through the early 1980s, and, although it was shopped extensively by WerBell to the military — his suppressors were used in small numbers by special operations guys like MACVSOG and the like in Vietnam — the gun received few military orders. As noted by firearm historian Frank Iannamico, the Navy SEALs purchased a small quantity of Ingrams in 1971 and used them as late as the first Gulf War in 1991. The M10 saw a very small amount of U.S. military service but was extensively marketed overseas throughout its production history. 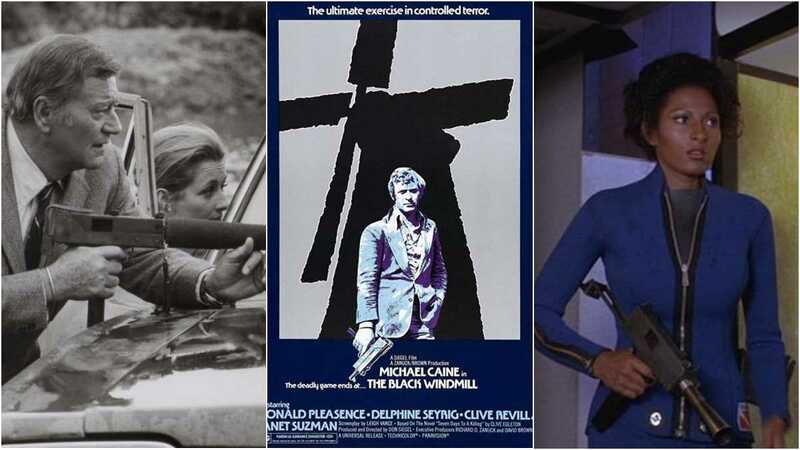 However, the MAC-10 (a designation that was never actually used by the company), became hugely popular during the Disco-era as it appeared in the hands of John Wayne in the crime drama McQ, Michael Caine in the spy thriller The Black Windmill, and Pam Grier in Sheba Baby, all in the same year. Since then, it has been in over 100 films as well as legions of TV shows and video games. Due to its compact nature, the gun also lived on in the late 1970s and early 1980s as something of a specialty piece for dignitary protection (there was even a model of briefcases marketed to carry the M10 ready to fire), and cloak and dagger types. Here we see SevenTrees compact holster/gun savant Paris Theodore with a holstered M11, as well as a later Desantis rig for carrying the M10 under a jacket. 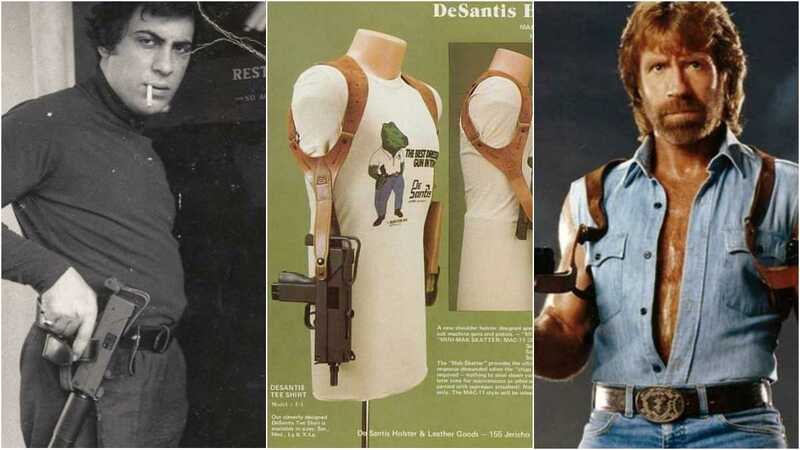 If the rig looks familiar, Chuck Norris wore a similar one for a pair of MAC-ish Micro Uzis in the 1985 film, Invasion USA. When the Hughes Amendment hit in 1986, it took the good old days of the relatively inexpensive — as low as $418 at the time — M10/11 out forever and the today the guns run north of the $7K mark for transferrable examples, as production long ago ceased. There is, of course, semi-auto Ingram-style pistols and carbines out there as well, but they are nowhere near as fun.